Scott Van Cleef, Vice President at Country Classics, was honored by the New Jersey Builders Association with its “2018 Builder Continuing Service Award” at the Annual Industry Awards Luncheon, which was held on Wednesday, January 23, 2019. The award is presented annually to recognize an NJBA member’s continuing support through a progression of service at various levels of the association. Alongside his brother Todd, Mr. Van Cleef has dedicated his career to building superior homes in inviting neighborhoods that meet and exceed the dreams of homebuyers in both New Jersey and Pennsylvania. At the Industry Awards Luncheon, he was recognized for his commitment to the Association from the very beginning of his career. Mr. Van Cleef serves on the NJBA’s Board of Directors and has served on his local Board as well. 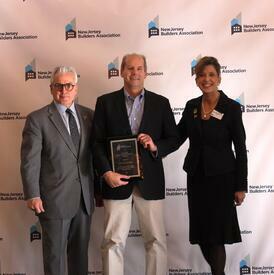 He has served both organizations through the Legal Action Committees and is also a member of NAHB’s Builder 20 Club. Mr. Van Cleef finds great value in the educational programs and conferences hosted by NAHB, NJBA, and METRO, a local trade organization from which he and his brother Todd received the Builder of the Year Award in 2016. The award also commemorated Mr. Van Cleef on Country Classics’ philanthropic efforts. The company has a longstanding history of supporting a multitude of organizations that benefit those in need in the local community. Most notably, Country Classics is an ardent supporter of Safe & Sound Somerset, GiGi’s Playhouse in Hillsborough, the Adult Day Care Center of Somerset, Hands Together (provides shelter, fund education, to those in need in Haiti), and the National Multiple Sclerosis Society. In 2017, the Van Cleefs received the Safe & Sound of Somerset Humanitarian Award for their continuous donations and support. For over 30 years, Country Classics has been a premier builder of luxury single family homes, apartments, townhomes and active adult communities in New Jersey and Pennsylvania. The family-owned builder is currently building home sites in Country Classics at Hillsborough, which is in its final phase after becoming home to over 800 satisfied homebuyers. Luxury apartments are available to rent at Fairway 28 in Bridgewater, NJ, and the builder is scheduled to open another rental community in Somerset, NJ in Fall 2019. For more information about Country Classics new home communities and rentals, visit www.country-classics.com or call 908-359-3276.